When Alexander the Great died as a young man, his empire was divided up to be governed by his generals. Egypt was governed by one of Alexander's generals named Ptolemy Soter. 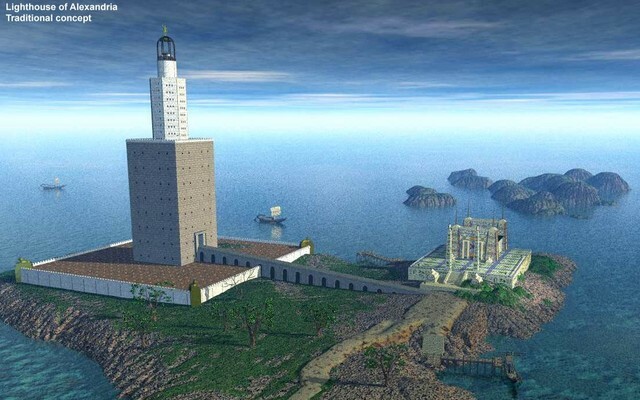 Ptolemy began a lighthouse on an island called Pharos in about 290 B.C., adjacent to the harbor of Alexandria, and it was finished by his son after his death. The lighthouse is described as being of three sections. The lower section was square and 184 ft in height. The middle section was octagonal and 90 ft tall. The upper section was circular and 24 ft high, for a total building height of 384 ft, equivalent to a 40 story building. The core of each section was hollow and provided a circular core which was used to lift fuel to the top of the structure. 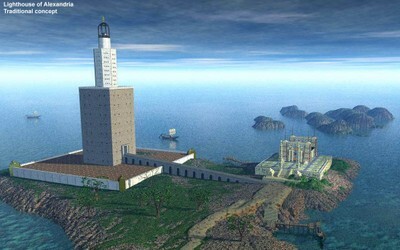 The lighthouse was the tallest structure in the ancient world. By comparison, the tallest lighthouse in the modern world is the Marine Tower in Yokohama, which stands 348 feet tall. During the night a fire was kept lit, and a reflecting mirror directed the light. During the day the reflector was used to reflect the sun for a distance of 50 km. The reflector was removed by the Arab conquerors of Alexandria in 690 A.D. In the 1300s two severe earthquakes made the lighthouse a ruins. It was finally dismantled in 1490 and the stones incorporated into the walls of Alexandria by the Egyptian sultan. The drawing below is by Bill Munns from his site Seven Wonders of the Ancient World. Pharos was also the original name of what is now known as the i-stop, which is a pole based, bus signalling device that is currently used around the world to signal drivers that a passenger is waiting to be picked up.